From Susan: My husband of 20 years and I live in Portland, Oregon and have an 18 year old son who will be a freshman at the University of Chicago in September and a 16 year old daughter. I have been a Psychotherapist and Marriage and Family Counselor for 24 years. I work out, do yoga or walk almost every day and still play piano. We spend much vacation time visiting family in California, where we lived for over 24 years. From Colleen: I will be attending the reunion with my husband, Jim. I hope to see many of you there. I don't think I will be getting to Minnesota in time for the Surf Belles at Central. Somehow 40 years seems to have gone by very quickly. My life has been great with my husband, Jim, of almost 37 years, 3 terrific, loving children and now 3 grandchildren! We have lived many places around the country and have found good friends eveywhere. God has truly blessed my life. From Connie: It's hard to believe that it's been 50 years! I attended the U of M, graduating in Winter 1973 with a major in American Studies. I married Mel Dickstein (SLP 1965) in 1969 and we divorced in 1977. I worked for Prudential, then did various other things before moving to Israel in 1985. I didn't stay long; I got married again and we moved to NYC at the end of 1986, where I've been living ever since. My son is now 30 years old and a newly-minted lawyer, working at a firm in Manhattan. I got a degree in opticianry at a local college and I've been working in that field for 16 years, part of that time as an instructor in the college. I'm a pretty enthusiastic knitter, and I do a lot of urban hiking. I've been single again for a long time. I love the excitement of The City and I'm still working, but MN always seems so easy and beautiful when I come to visit that I think about moving back some day. I even miss those winters - at least the snow is clean and they know how to plow it! From Mary: I am looking forward to the reunion!!! I have been married to Chuck for 38 years and we have 2 children and 4 grandchildren! We have lived in Willmar since 1970. Enjoy spending time with family (especially the g-kids) & friends, dancing, outdoors and some travelling. Debby (Patrick), maybe we should try frying an egg on the sidewalk again some day! Thanks to all the event organizers!!! I appreciate all the time and work you have put into planning the event, website, etc.!!! From Mary: First of all, thanks to the event organizers! I will not be attending, but will be thinking about all of you. I had to set up a new profile, since by old email is no longer in existence, so here goes. I have been happily married to Chuck for 48 years! We have 2 children and 4 grandkids. We retired 5 years ago, on the same day. Was a good option for us. Retirement has afforded us more time to enjoy the g-kids and travelling. We do some trips on our own, but also enjoy bus tours. We still enjoy dancing too. I started taking piano lessons 3 years ago and really enjoy it! Never too old to learn something new! Please feel free to send me a messsage and let me know what is happening in your life! I would love to hear what you have been doing! From Robbie: Fifty years later....WOW! Kept my maiden name Perl with marriage to Rick Garon, Duluth East class of '65. We've lived in the same neighborhood for 39 years though we did tear down & build a new house on our lot 17 years ago. I can look out my living room window & see the house I grew up across "Perl's Park". I've cut my grey hair short; dropping the "bob" I sported for years. Daily exercise is a priority, cycling & walking outdoors when weather permits, indoors when necessary. Still doing yoga though my practice is getting smaller after knee & back surgeries. ​In June of 1969 I married Sanford (Sandy Proosow). We were young (too young) and in love. We divorced in 1983. Two wonderful children blessed us though: Stacey and Brian. Both are now happily married each with three terrific children and spouses. Brian and family live in northern California while Stacey and family are here in Minnesota. Sadly, in November of 2016 Sandy passed away at age 69 from many illnesses. ​I remarried in 1992 to a tall, blonde-haired man with a great sense of humor and a love for learning, music and travel. His name is Steve Peterson and we will celebrate our 25th wedding anniversary in December. We have enjoyed trips to the North Carolina, California, Grand Canyon, Yellowstone, Bryce Canyon and most recently Yosemite National Park with Brian and family. For part of the past three years we spent time in Florida. ​I love spending time with family. Love those grandkids! My hobbies include photography, oil painting, reading, exercise, cooking, baking and travel. Life is good. Susan Petrikat has developed advanced-stage Alzheimer's and is currently located at the Menno-Olivet Care Center in Menno, SD. She can no longer talk, walk, or do anything for herself. I, Landon Nusz, have been her companion for 21 years, and am trying to give her the best care available. Unfortunately, Susan has recently taken a turn for the worst, and I don't expect her to be around much longer. I am putting together a biographical sketch for Susan, but don't really know much about her history before 1997. If anybody can offer any information on Susan during her earlier years, please email it to me at: Lnusz@sprintmail.com. Thank you. From bruce: Boy, where did the time go! It's seems like we're just getting started. 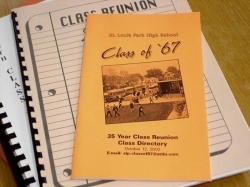 Really enjoyed going over this site, as I haven't been very good about going to our reunions. It was fun to see how life has changed us and how we turned out, it probably surprises alot of our teachers, I know mine for sure. I have three grown children, been basically retired since '97, divorced twice ( can"t seem to get it right ) live on a lake up north and the first snowflake I see, I head south for the winter. This year it's South Padre Island, Texas, right now it's about a 80 degree difference than back home. Haven't hardly seen any classmates, we all get busy with jobs, family and our lives. I used to get together with J. Rutz, Reggie, Lee, Jeff and the others for some fishing trips but thats been awhile, I think they just wanted me to land their fish!!!!!!! Just kidding. Well, take care, and if any of you old jocks still have it, the Vikings need a new coach and a quarterback, and the Wild needs someone that can score some goals. From Carol: Budd (Southwest, '66) and I have been married for 36 years. We have lived in the same house in southwest Minneapolis for 35 years and have three great kids, Jacob, 31, Benjamin, 27, and David, 20. I majored in Sociology and Early Childhood at the U of M and worked in various daycare centers until we had kids, and then was happy to be a "stay-at-home mom." Eventually I went to graduate school at the University of St. Thomas to get a teaching degree (I learned more in one semester than in four years at the U) and have been an elementary school substitute teacher (also sometimes referred to as a "guest teacher", "reserve teacher " and---my favorite---"stunt double"). I work mostly in Minneapolis, sometimes in St. Louis Park and could write a book, as most teachers probably can. When I'm not working or on a car trip, I'm with family or friends, quilting, reading, and wondering how 40 years went by so quickly! From Maureen: okay, all of you retired classmates; i found myself in retirement status two years ago as well, however, that only lasted three months! After having been in biz with my mother for over 23 years (Rainbow's End Bakery - SLP) the following "series of misunfortunate events" happened: My dad passed away, mother retired; my husband suffered a heart attack (yes, TG he survived!) and of all things, I became intolerant to flour and sugar!!! We "retired" from the biz two years ago and although it was a passion of mine, I have found that there is life out there without working 90 hours a week! I am now working part time in Sales/Marketing and in process of writing a specialty cook book which will include all the old bakery recipes! (If you want to get your name on the upcoming newsletter/mailing list: rainbowsendcookbook@q.com) (How could I have passed on a perfect plug...how many in our graduating class??!) We are enjoying having more time with our two grandchildren, more time with each other (after 39 years of marriage!) and have recently "rescued" a 3 yo Wheaten Terrier, and love to walk the lakes with her. Hope to see you all soon! From James: After high school graduation I enlisted for the Warrant Officer Flight Program. I left active duty in 1971, but joined the MN Army National Guard where I continued to fly. I stayed in an Army Guard or Reserve unit until I retired in 1995 as a CW-4. After getting out of the active military, I attended engineering classes at the University of Minnesota graduating in 1975 with a BSME. I also married my first wife Catherine Deeds, a girl from Edina (I should have known). My whole career I worked for some agency of the U.S. Government. My first job was with U.S. Navy, working on submarines. Then I transferred to the Army in 1977 where I worked on Aviation Ground Support Equipment in St. Louis, MO. I transferred to a Defense Contract Management Command co-located with FMC Corporation in New Brighton, MN in 1980, naval gun mounts and missile launchers. My daughter Lesley was born in 1982, (the best thing to come out of my first marriage). I transferred locations again this time to a U.S. Navy/ U.S Air Force/ Defense Contract Management Agency in Grand Prairie, TX. collocated with LTV Corporation, fighters , bombers and heavy lift aircraft. I remarried in 1993, to a Texas gal Jeanne Barron, we’ve been married 23 years now, we are quite happy. Jeanne’s dental hygienist is Noel (Mary) Reese since the 1970’s. I changed to the Federal Aviation Administration where I did aircraft certification work. The FAA was the best, most engineering based job that I have had since working for the Navy out of the college. Since retirement Jeanne and I have traveled a little and have taken “Senior” classes through the Tarrant County Community College, my thing is woodcarving. We moved to Dallas, Texas right after I was the maid of honor at Jan Herrmann's wedding in the summer of 1967. I attended NTSU in Denton from 1968-1972 and got my degree in Psychology. How I graduated is beyond me. I had too much fun! It was the 60's!!! I've been a hygienist since then and have worked for the same dentist for past 31 years. I became a realtor with Keller Williams in 2000 and continued to work part time at the dental office. I'm still working at both jobs. I married a retired dentist, Jim Barton, in 2014. He has two daughters and four grandchildren. Instant family! He has 73 acres, one hour from our house, where we spend most weekends. Riding around in the Gator with the dogs, drinking beer, shooting, fishing, kayaking, and cutting wood for our fireplace. It's tough but, somebody has to do it! Vickey, Joyce, Diane, and I have been getting together for the past few years. You all will see us together at the reunion. I am really looking forward to seeing everyone. I may need to be reminded who everyone is and how we're connected. I've slept since 1967!!! See you all in August 2017-I still can't believe it's been 50 years!!! From Linda: Just happy to be here!